CAOS SINGS, Are You Listening? A Christmas Concert for one night only. 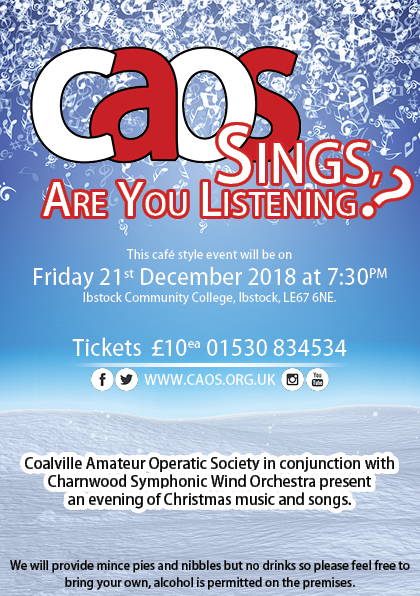 Coalville Amateur Operatic Society in conjunction with Charnwood Symphonic Wood Orchestra present an evening of Christmas music and songs. Tickets are £10 each and can be purchased from the CAOS Booking Office 01530 834534 or on our online “Booking Form“. We will provide mince pies and nibbles but no drinks so please feel free to bring your own, alcohol is permitted on the premises. 08/11/2018: Rehearsals for the concert have begun with special care being given to Songs from Joseph and the Amazing Technicolour Dreamcoat. 07/12/2018: Uh oh! Tickets are now Sold Out!